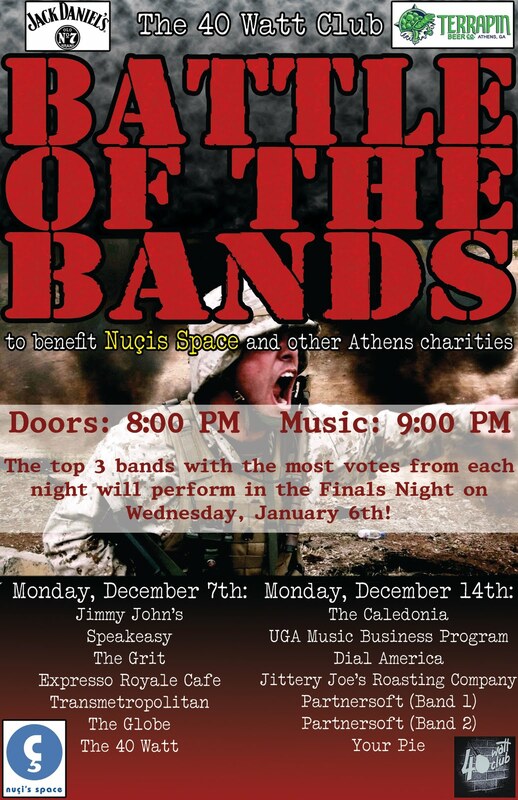 The second annual Battle of the Bands is happening TONIGHT at the famed 40 Watt Club. The last one was such a success that organizers brought it back for another round. So let’s look at the contenders! The First night’s competition looks rough with the cool jazzy feel of Speakeasy, the hyped up Expresso Royale Cafe, the Italian tinged Transmetropolitan, and the grad student haven The Globe. Unfortunately, the 40 Watt, Jimmy John’s, and the Grit bands had to drop out. The entire thing is emceed by the only obvious choice, Clay Leverett. You may remember him from our Flagpole awards… And the celebrity judges for the night? None other than Wil Greene (GA Theatre) and Scott Shamp (UGA New Media). Now, in all seriousness, each of the above establishments have a band in the competition, made up of employees and owners of said businesses. I have NO clue what any of them sound like but I promise that it’ll be an evening to remember. All the money goes to Nuci’s Space and other local charities. But you get a say in who advances to the next round. The top 3 vote getters from each night move on to the final show in January. Next Post R.E.M. Fan? There’s an App for That.